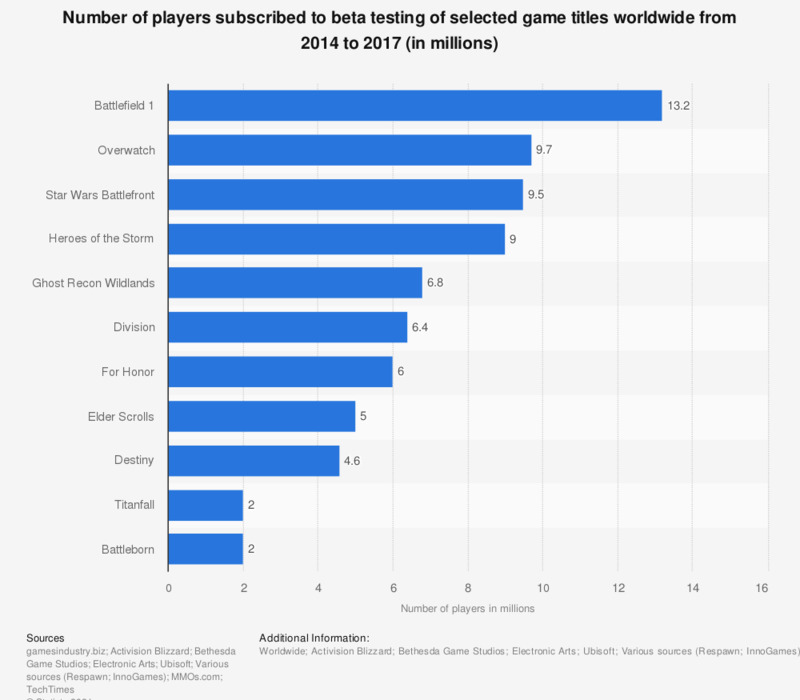 The statistic presents the number of players subscribed to beta testing of selected game titles worldwide from 2014 to 2017. Most recent reporting shows that Blizzard Entertainment's first-person shooter game Overwatch drew in 9.7 million players to its beta version. The game’s closed beta testing was made available on Twitch in late October 2015, where it ranked seventh based on hours viewed within an opening week. Overwatch’s final release version became available for purchase on May 24, 2016. Star Wars Battlefront open beta version was first accessible on October 8, 2015 and quickly attracted more than 9.5 million players. The finished version was released a little over month later. Its digital console version became one of the leading titles in 2015, having generated 106 million U.S. dollars in worldwide revenue. Ranked fourth is Blizzard Entertainment’s Heroes of the Storm. Before it was released for general public use on June 2, 2015, the game was available for open beta testing from May 19, 2016. Activision revealed that over nine million people subscribed for eligibility to beta test Heroes of the Storm. According to industry projections, the game is expected to hold a seven percent share of the entire 2016 MOBA market, based on PC and console revenues. Fifth in the ranking, Tom Clancy’s The Division, began open beta testing on February 18, 2016, for Xbox One, and PC and PlayStation 4 a day later. Beta testing finished on February 22, 2016 for all platforms. In the four days of open beta testing, more than 6.4 million players took part in the process. The finalized product was released to the market on March 8 that year. Soon after that, Ubisoft announced that Division had managed to generate 330 million U.S. dollars in global revenue within a week of its release date.